You must have heard that if there is a sister or a brother, you don’t need a friend and I have experienced the same first hand, so I can vouch for it, however, all this is true once the children are old enough to understand intense emotional feelings. Till then, for a mother, it’s a long career of being a referee or an umpire. The moment you become a mother, the second time you have to gear up for this position. It doesn’t matter if the kid 2 is only a baby and goes gaga, goo the whole day; there will be some obscure way by which your kid 1 is annoyed and you are summoned to ensure peace. If the age difference isn’t much and they are either two girls or two boys, there is a different problem. Child 1 will automatically get territorial and there will be a verbal or non-verbal war about who owns Mumma! (read who gets the most attention) and somehow you end up doing a lot of explaining and cajoling of how the time and attention is being given equally to both. They won’t understand or accept however you will keep trying to avoid the house from falling around your ears. If the age gap is enough where the older sibling is at an age where he can act responsibly, suddenly all the love and anticipation related to the arrival of child 2 will vanish and you will have to answer some weird questions, like “Who decided that I will get a baby brother?” “I don’t like this baby, please go and get it exchanged!” There won’t be open fights in such a scenario, but minor skirmish that you will know exactly who started but have no evidence to pinpoint! Yeah! Well, you even turn into a part detective, but more about it later. And if you try accusing one child of starting it, that child will sulk and other will blame you for hurting the sentiments! So, you end up having a long career of being an umpire where your decisions are seen with suspicion, nobody is ever happy with you and somehow both believe that you favor the other as if this wasn’t a family but an India-Pakistan match! Do you have two children? What have been your experiences? 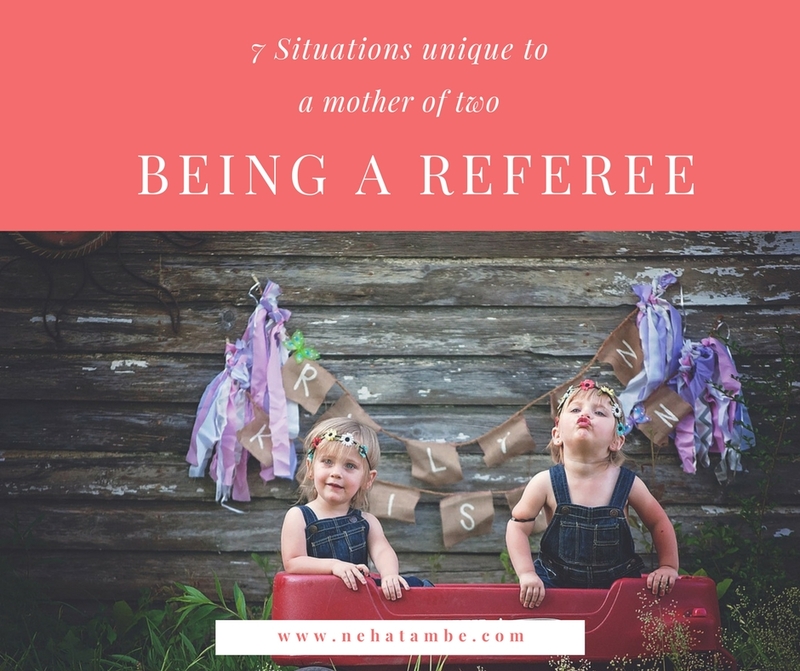 I am a soon-to-be referee:) Currently, a lot of my thoughts are also looming in the field of how different it is going to become a parent second time around and the new challenges and joys that is going to come along. That is one of the reasons my theme for the barathon skirts around the edges of parenting. I generally avoid mommy blogs but your playful take on this is so adorable and true that I can’t help applaud it. It’s a real practicality that I have done as a child to my mother n probably do till date…. My mom and dad are still referees though… Trying to pacify me and my siblings 😊 Seems like the kids never grow. I can imagine how witty and mindful parents have to be in these situations. But it would be fun to play detective and find the culprit though. Totally loved your smart take on parenting. Well, I have seen my mom go through this role and it’s really hard to handle especially when the age difference between the sublings is less. I love your take on parenting here. I have seen my mom struggle betwene me and my brother. It’s usually tougher when the age difference is less. OMG, I didn’t like this baby, get it exchanged! Neha, I could never imagine such and indeed the life of referee is so challenging. Since I have a boy only, so I never thought of such scuffles. That’s such a playful and cute take on siblings rivalry. Tho the fights don’t last for long yet I have seen parents getting flustered in all of this! This made laugh harder and to be honest this sentence perfectly describes my situation ..
That’s very common scenario of every home where mother’s has to play the role of referee and yes it’s not easy to make the right decision. Love your take on the seven series. I agree two kids with not much of a difference fights a lot and mother becomes a referee. And it becomes very important to be a good and strong referee.